Cemento-osseous dysplasia is a non-neoplastic process usually confined to the tooth bearing areas of jaws or edentulous alveolar process. Cemento-osseous dysplasias are categorized into three types on basis of the clinical and radiographic features: Periapical, focal and florid. Focal cemento-osseous dysplasia is benign fibrous osseous condition that can be seen in dentulous and edentulous patient. The lesion is detected only on radiographic examination with variation comprising a combination of radiolucent and radiopaque pattern. It is asymptomatic and needs no treatment. We report an unusual case of concomitant occurrence of infected focal cemento-osseous dysplasia in mandible with atypical clinical presentation of two sinus openings and a radicular cyst in maxilla. The focal cemento-osseous dysplasia exhibits a single site involvement in any tooth bearing or edentulous area. It usually affects two or more mandibular teeth and radiographic appearances vary depending on the state of development. Some studies described demographic, clinical, radiographic and histopathological features of focal cemento-osseous dysplasias similar, if not identical to periapical cemento-osseous dysplasia and concluded that periapical cemento-osseous dysplasia and focal cemento-osseous are the same process. ,,,, Su et al. Considered periapical cemento-osseous dysplasia and focal cemento-osseous dysplasia are two different forms of same condition with different location. 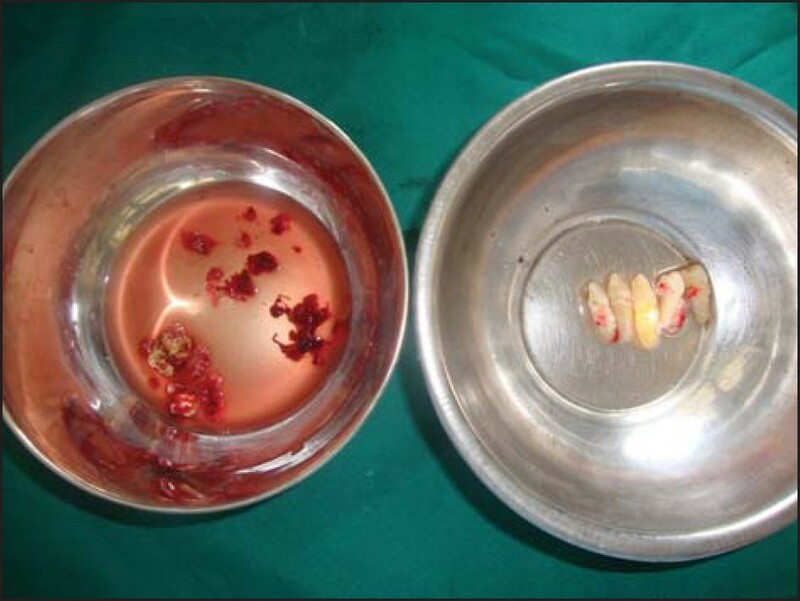 , The present paper reports a case of concomitant occurrence of infected cemento-osseous dysplasia with atypical clinical presentation in mandible and a radicular cyst in maxilla in a young Indian female. This case report is rare as cemento-osseous dysplasias are very rare in Indian population and this paper highlights the role of histopathological examination in differentiating the periapical cystic lesion of maxilla as radiographically early lesion of cemento-osseous dysplasias mimic the periapical radiolucent lesions. A 20-year-old year Indian female reported to department of oral medicine and radiology with a complaint of dull continuous pain in lower jaw and salty discharge from the gum boils in the same region, which was intermittent. On extraoral examination, no abnormality was detected. Intraoral examination revealed two sinus openings on labial gingival in relation to left central incisor and right lateral incisor [Figure 1]. All the teeth in the site of lesion in mandible were found to be vital. The maxillary left lateral incisor was found to be non-vital. Radiographic examination revealed well-defined non-sclerotic radiolucency with multiple radiopaque foci, some of them presented at the periapex of the tooth [Figure 2]. Well-defined radiolucency was noted at the apex of maxillary left lateral incisor with root resorbtion. Gutta-percha points were placed in two sinus tract and occlusal radiograph showed opening of sinus tract into the lesion [Figure 3]. Considering the classical radiographic finding a provisional diagnosis of focal cemento-osseous dysplasia with differential diagnosis of chronic sclerosing osteomyelitis was made for the lesion in mandible. Considering the history of trauma to upper lateral incisor and its non-vitality, a working diagnosis of radicular cyst with maxillary left lateral incisor was made. Her blood picture was within the normal limits. Lesion of mandible was totally excised along with the involved teeth under local anesthesia. 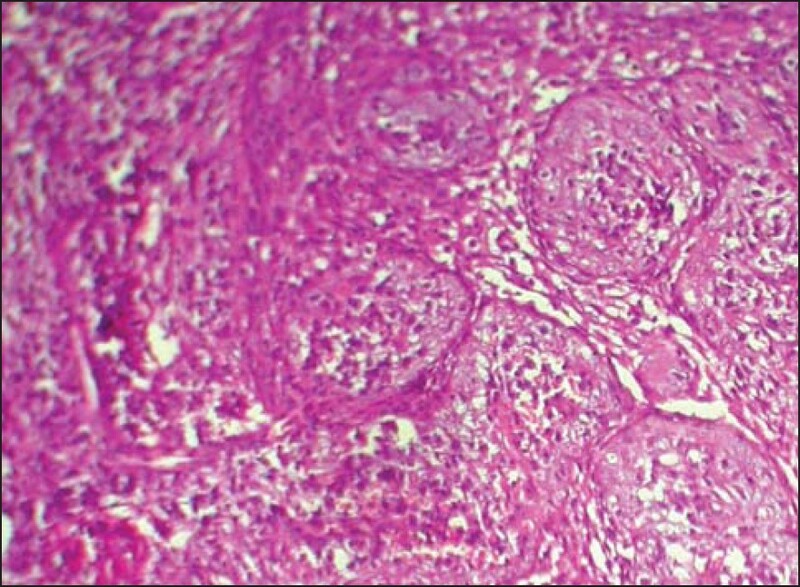 Multiple gritty fragments were obtained and surgical specimens were submitted for histopathological examination [Figure 4]. Histopathological finding revealed fibro cellular connective tissue consisting of irregularly arranged collagen fibers, scattered round to oval basophilic structures suggestive of mineralization with dense inflammatory infiltrate chiefly composed of lymphocytes and plasma cells and prominent hemorrhage is also evident. 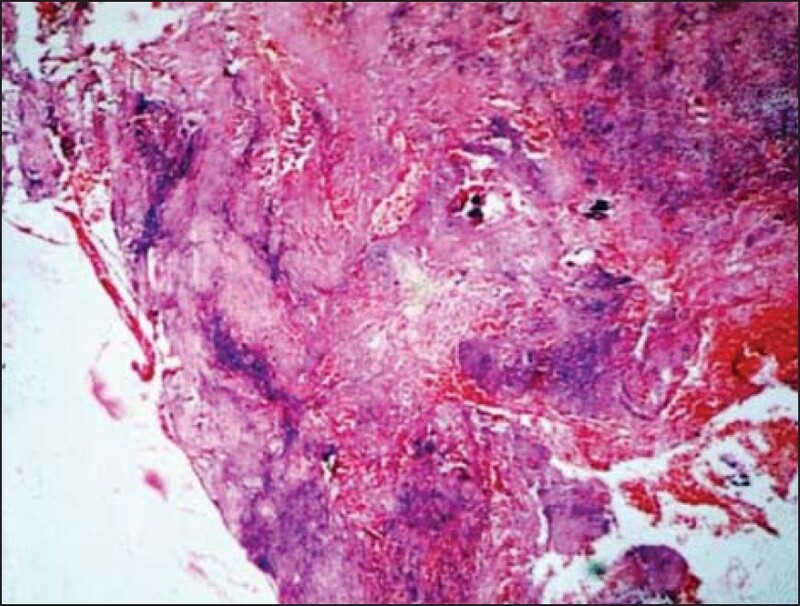 Decalcified H and E stained sections showed dense sheets of eosinophilia mass suggestive of trabecular compact bone with minimal amount of fibrous tissue suggestive of infected cemento-osseous dysplasia [Figure 5] and [Figure 6]. Maxillary lateral incisor was treated with root canal therapy with apicetomy of periapical lesion, which confirmed its diagnosis to be radicular cyst on histopathological examination [Figure 7]. Unfortunately patient did not turn for follow-up and was lost to recall. Cemento-osseous dysplasias are very rare in Indian population. A systemic review on florid cemento-osseous dysplasias showed less than 2% of cases from whole series that combined most of cases reported around the world. Focal cemento-osseous dysplasia occurs with greater frequency in posterior mandible and the greatest frequency is noted in patients in fourth and fifth decades. Focal cemento-osseous dysplasia is seen predominantly in African-American black women. The present case was seen in 20-year-old Indian female. Focal cemento-osseous dysplasias in association with simple bone cyst and dentigerous cyst have been reported, , but concomitant occurrence of focal cemento-osseous dysplasia and radicular cyst in same patient has not been reported in the literature. 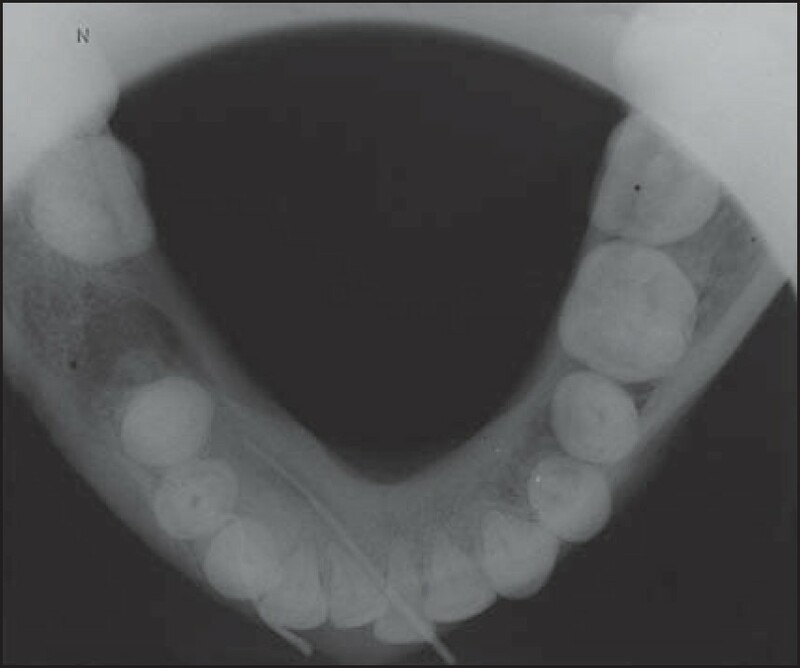 Focal cemento-osseous dysplasia is seen mostly frequently with vital teeth in anterior and premolar regions of mandible, 70% of focal cemento-osseous dysplasia cases display an intimate relationship with periapex. The remaining 21% is found in site of previous extraction and can reach a size of 1-2 cm. It may be localized nearby teeth. In the present case, lesion extended from anteriors to premolar region. Focal cemento-osseous dysplasia is usually asymptomatic but can cause expansion of local bone and can be secondarily infected. Some authors considered that infections of focal cemento-osseous dysplasia are secondary to the exposure of the cementical masses following resorbtion of the edentulous alveolus or by extraction of teeth with roots close to the lesion. Infections of focal cemento-osseous dysplasia may induce chronic sclerosis and true chronic osteomyelitis could appear similar to focal cemento-osseous dysplasia. In the present case, infection was present with two sinuses. The source of infection in the present case is unknown. Infection process may have increased the pressure in the cavity resulting in burst openings to form the sinuses as seen in the present case. Radiographically focal cemento-osseous dysplasia in the early stages is fairly well-defined radiolucency with a sclerotic border with loss of periodontal space and lamina dura. The histopathological confirmation of radicular cyst in maxilla was very important in the present case as radiographically, cemento-osseous dysplasias in the early stage mimic the radicular cyst or periapical pathologies and also to differentiate the present case from early stages of florid cemento-osseous dysplasia. In the intermediate stage displays a mixture of radiolucent and radio opacity as this is stage of deposition of cementum like droplets in the fibrous tissue. At this stage, lesion can be misdiagnosed as cemento-ossifying fibromas. The last mature stage could be osteosclerotic and inactive stage and could be identified by definite radio-opacity in major part of lesion. The present case was in mixed stage with non-sclerotic borders due to presence of infection. Focal cemento-osseous dysplasia represent self-limited reactive lesion. Once diagnosis is established no treatment is necessary. Prognosis is excellent, but follow-up is warranted because of possibility of progression to florid cemento-osseous dysplasia. Simple bone cysts develop besides focal cemento-osseous dysplasia, in such cases surgical exploration and biopsy is necessary to establish the diagnosis. It is not known whether the bone after healing period will be adequate for osseointegrated implants after removal of the lesion, as cemento-osseous lesions have clinical importance due to edentulous sites requiring the osseointegrated implants. However as in present case, the lesion was symptomatic with sinus openings hence the lesion was surgically removed. To conclude though the east Asian and African origin are risk communities, focal cemento-osseous dysplasia is now globally distributed, thus enhancing the focal cemento-osseous dysplasia's clinical importance to all dentist and oral and maxillaofacial practitioners as surgically treated patients require the treatment, which is clinically demanding. 1. Mupparapu M, Singer SR, Milles M, Rinaggio J. Simultaneous presentation of focal cemento-osseous dysplasia and simple bone cyst of the mandible masquerading as a multilocular radiolucency. Dentomaxillofac Radiol 2005;34:39-43. 2. Mahomed F, Altini M, Meer S, Coleman H. Cemento-osseous dysplasia with associated simple bone cysts. J Oral Maxillofac Surg 2005;63:1549-54. 3. Bulut EU, Acikgoz A, Ozan B, Zengin AZ, Gunhan O. Expansive focal cemento-osseous dysplasia. J Contemp Dent Pract 2012;13:115-8. 4. Bhandari R, Sandhu SV, Bansal H, Behl R, Bhullar RK. Focal cemento-osseous dysplasia masquerading as a residual cyst. Contemp Clin Dent 2012;3:S60-2. 5. Su L, Weathers DR, Waldron CA. Distinguishing features of focal cemento-osseous dysplasias and cemento-ossifying fibromas: I. A pathologic spectrum of 316 cases. Oral Surg Oral Med Oral Pathol Oral Radiol Endod 1997;84:301-9. 6. Su L, Weathers DR, Waldron CA. Distinguishing features of focal cemento-osseous dysplasia and cemento-ossifying fibromas. II. A clinical and radiologic spectrum of 316 cases. Oral Surg Oral Med Oral Pathol Oral Radiol Endod 1997;84:540-9. 7. Draziæ R, Miniæ AJ. Focal cemento-osseous dysplasia in the maxilla mimicking periapical granuloma. Oral Surg Oral Med Oral Pathol Oral Radiol Endod 1999;88:87-9. 8. Summerlin DJ, Tomich CE. Focal cemento-osseous dysplasia: A clinicopathologic study of 221 cases. Oral Surg Oral Med Oral Pathol 1994;78:611-20. 9. Sanjai K, Kumarswamy J, Kumar VK, Patil A. Florid cement osseous dysplasia in association with dentigerous cyst. J Oral Maxillofac Pathol 2010;14:63-8. 10. Macdonald-Jankowski DS. Focal cemento-osseous dysplasia: A systematic review. Dentomaxillofac Radiol 2008;37:350-60. 11. Kawai T, Hiranuma H, Kishino M, Jikko A, Sakuda M. Cemento-osseous dysplasia of the jaws in 54 Japanese patients: A radiographic study. Oral Surg Oral Med Oral Pathol Oral Radiol Endod 1999;87:107-14. 12. 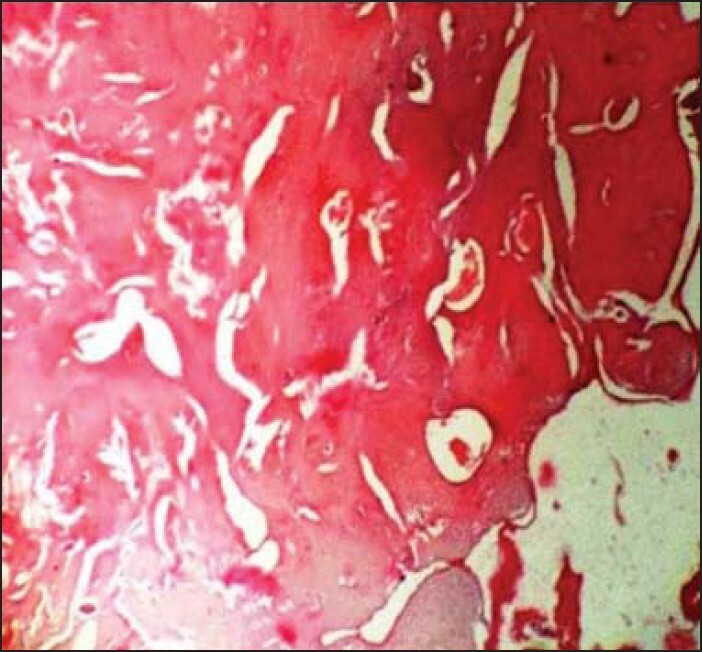 Singer SR, Mupparapu M, Rinaggio J. Florid cemento-osseous dysplasia and chronic diffuse osteomyelitis Report of a simultaneous presentation and review of the literature. J Am Dent Assoc 2005;136:927-31. 13. Yazicioglu D, Tuzenur-Oncul AM, Ucok C, Dereci O. Focal cemento-osseous dysplasia: A case report and literature review. Health 2012;2:941-4. 14. Singh M, Singh S, Jain J, Singh KT. Chronic suppurative osteomyelitis of maxilla mimicking actinimycotic osteomyelitis: A rare case report. Natl J Maxillofac Surg 2010;1:153-6.